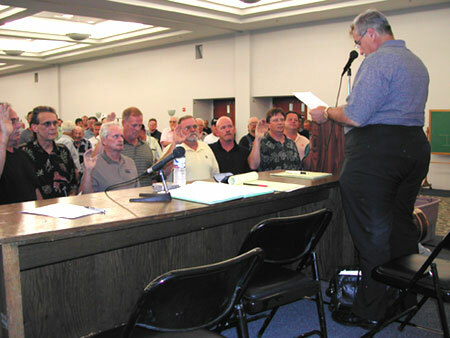 Wednesday, July 9, 2003, at the Walter R. Mabry Labor Center in Warren, newly elected Michigan Regional Council of Carpenters and Millwrights (MRCC) Local 687 delegates and officers were sworn in by Tony Michael, Executive Director for the MRCC. Those elected include: Mike Davis, President; John Wetherlee, Elected Vice President; Mike Jackson, Recording Secretary; Tim Kelly, Financial Secretary; Rich Davis, Elected Warden; John Schoder, Jr., Elected Conductor; and Trustees, Scott Lewis, Charlie Jackson and Robert Featherston. Note: Mike Jackson is wearing the 'yellow' shirt partially covered by the microphone head.